Upstate - "The Official Soundtrack: Missing"
Upstate is a band with members split between Denver, Colorado and Dayton, Ohio, and grew out of an earlier band called Dishwater Psychics. The band consists of John Wenzel on guitars and vocals, James Focht on guitars and vocals, Dan Miller on guitars, keyboards and vocals, Jamie Heaps on drums and percussion and Chris Jones on bass. 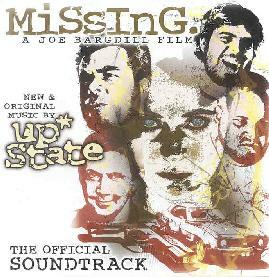 The 5 songs on this 17 minute CDEP are Upstate's contribution to the film Missing, an independent production made in Dayton. The CD opens with "Falling Missiles", the track that ended up being my favorite. It's a dark song with a repetitive guitar/bass phrase, around which Upstate build the song and instrumental theme. We've got a bit of modern rock, a dash of prog, and a hint of psychedelia and even some Pink Floyd near the end. I like the full sound produced by the multiple guitars, both acoustic and electric, on the remaining songs, and we're treated to little bits of psychy guitar from time to time as well. And Upstate do a good job of creating a dark atmosphere that is more contemplative and still upbeat, than foreboding or depressing. Nice stuff. For more information you can visit: http://www.friendlypsychicsmusic.com. Visit the Missing film site at: http://www.brokenlamp.net.